Synaptop™ (www.liveevent.co) officially announces the launch of Live Event at NAB 2015 in Las Vegas. Live Event lets studios, broadcasters, agencies and advertisers host live digital events with real-time elements. Audiences can bring friends from social media to view rich media content together in real time, in sync while text and video chatting. Live Event is integrated with Twitter and Facebook, accessible from any device with nothing to install. Live Event lets studios and broadcasters host live digital events with real-time interaction directly to target audiences. The platform enables implementation of live contests, fan interaction with celebrities and guest panels. Direct interaction and user engagement including one-to-many moderated communication is available. A moderator portal within Live Event gives broadcasters full control of interaction during the event. Synaptop, exhibiting at NAB 2015, will demo the Live Event portal with all integrated elements including moderator portal and social media. Social media integration within the application brings second screen to the event portal for all connected users to see real-time updates. Live Event allows easy integration of social media streams, real-time chats and Facebook and Twitter feeds with trending topics alongside live video broadcast. 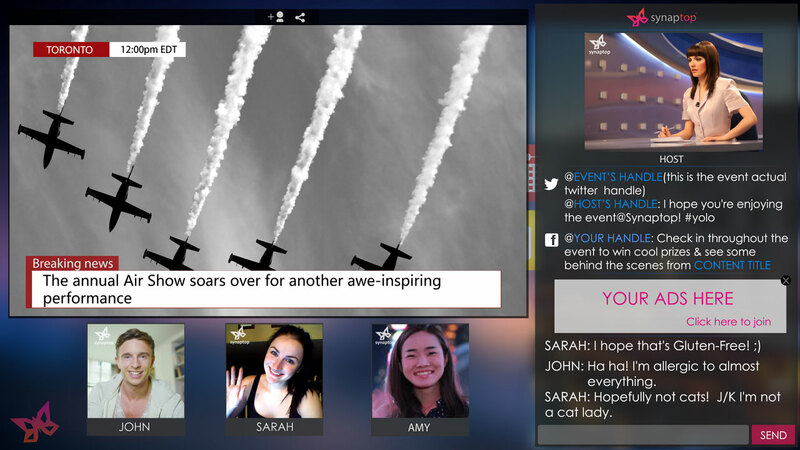 With Live Event, content generates viral buzz through real-time interaction and social media integration. About Synaptop™: Synaptop’s collaboration-enabled technology allows users to watch videos while interacting through video and text chat. Synaptop’s Live Event solution lets studios and broadcasters deliver digital content in an interactive virtual space to mass users.